It’s a new year, and this week Razorblade Arcade gradually got back into the swing of things on Wednesday. We started off the weekly raid quest, which was Malygos. It’s been so long since I’ve been in there! In fact, I apparently never actually did Malygos on 10-man before. Show’s you how my situation has changed… I used to do exclusively 25-mans, and now it’s only 10s. I’m glad I never uninstalled my MalygosCP addon, though. That little tool is still quite useful! After a quick Malygos, we went and did the first wing of Icecrown Citadel. It’s been about 3 or 4 weeks since I raided, and it was nice to be back. Not only that, but it was an extremely smooth run! It makes me quite happy to be in a consitent raid guild, once we learn an encounter, we rarely have problems with it again. We were so confident, in fact, that we decided to have a look at which achievements we might be able to get. We had no problems at all getting [Boned!]. However, we didn’t thing any other achievements would be as easy in one attempt, and our focus was on clearing the wing in one night so our other nights can be spent in the Plagueworks! 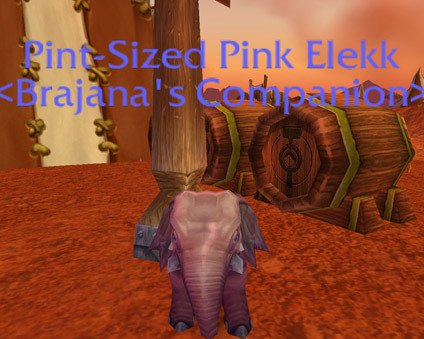 Oh, and Lady Deathwhisper was kind enough to hand over my coveted [Njordnar Bone Bow]! Thank goodness, I’m back to a bow and can take advantage of the 20 000 arrows I had stockpiled just before picking up my gun. 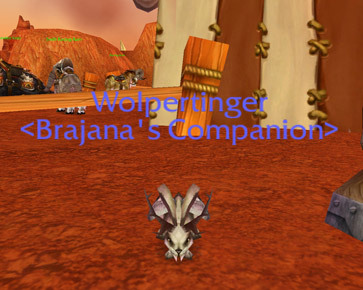 A Quick Brewfest Token-saving Tip! Just a quick tip that some people may not know about. 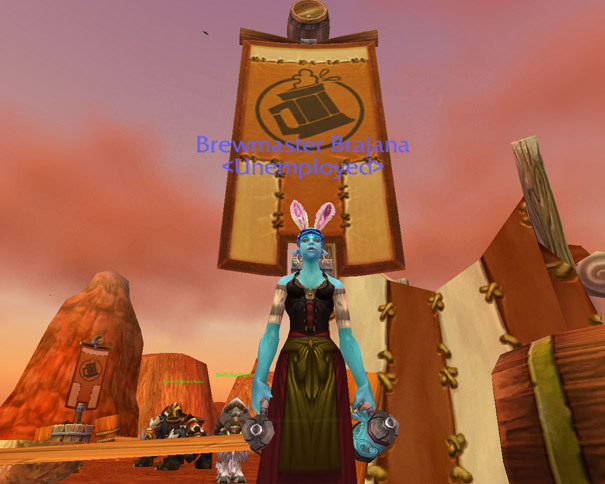 If you’re worried about getting enough tokens to afford the clothes, Brew of the Month Club, and the other fun little things you’d like, there is a way to save some tokens! You can return anything purchased from the token vendor for a FULL REFUND within 2 hours of purchasing! The key here is to save up enough to buy all 3 clothing items at once, go get smashed and dance in Dalaran, then head back and return them. Voilà! You just saved 350 tokens. Slacker of the Frozen Wastes! It’s been a while… I think this has been the longest break from blogging I’ve taken since I started. So glad to be back! Since the end of Blizzcon, I’ve left my job, started back at my last year of University, moved out, been homeless, moved in, been internet-less, been operable-computer-less… it’s been busy. But I think I’m finally all settled in, and my computer seems to be letting me use it… for now. What have I been up to in-game? Well, like I said, I’ve been busy… I think I’ve only played 3 or 4 times total since Blizzcon! But I have had fun in the little time I did play! 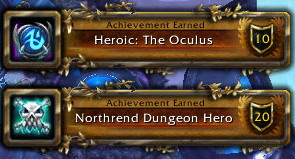 I finally ran Heroic: The Oculus and picked up my [Champion of the Frozen Wastes] title. I’m only, what, 8 months behind? Ah well, it was a guild group and I wasn’t the only one who had never been in there, so we took it nice and slow. Last night I was also able to get back into raiding. Unemployed is having some problems with our raiding base (more on this next time) and we’re only able to pull together 10-mans for the time being. To be honest, I don’t mind. I enjoy 10-mans, they’re a bit more fun and relaxing! Unfortunately some of my favourite people to play with have either quit the guild, the game, or are taking breaks. We did regular 10-man ToC yesterday, and cleared it straight from start to finish, one-shotting each boss and having only a couple deaths. I’d only seen the first 2 bosses, so it was quite exciting for me! Then we headed to Ulduar for some hard-modes, but without a Shaman, those are harder than they should be. Anyway, that’s just a quick update… more specific updates to come! Hope you didn’t miss me too much!